Save Money & Energy By Letting Us Help You Insulate Your Basement Today! Give us a call for a free Estimate! If we have an unfinished basement, we might be completely clueless as to what is happening in that section of our home. We know all basements typically are just a cold storage space below ground level. What may not come to mind is how much energy we are wasting by not having good insulation. We could be saving ourselves a good chunk of money every year if we do a little more investigating. Every year families in the Baltimore area could potentially be saving hundreds of dollars a year by properly insulating their basements. Heat itself moves from higher temperatures to lower temperatures, so naturally it is going to radiate where it tends to be cooler- into the basement. When our basement is lacking good insulation, the heat makes its way to the basement and heads to where it is cooler and escapes right outside. The result being: loss of heat and wasted energy that we’ve already paid for. If we are thinking of insulating our basements, we need to keep in mind just how much moisture is in the air and where it is coming from. There our 3 main culprits of moisture. Exterior moisture that enters the basement and is attracted to cooler surfaces. 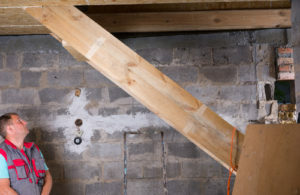 If you have a bad problem with excess moisture, you will need to address that before you insulate because it could end up ruining any work you are accomplishing. Keep in mind though by choosing the correct insulation and installing it properly, it will help prevent future problems with water issues. Too many people though, try to force finishing their basements and end up wasting money because they didn’t solve the problems that they were having with water beforehand, so please make sure to do find the source of the problem and address it before starting any project. – Spray foam: is probably the best possible insulation material for basements and damp areas. – Fiberglass Insulation: should NOT be used if you have any history or signs of water. – Cellulose: Is fire and mold resistant. So when put together with foam boards and taped joints it will help keep moisture from entering in from the damp walls made of concrete. Consider leaving this job to the professionals. When thinking of which type of insulation your basement needs, how messy it can be, and the cost of your time- Let us help you, give us a call today and we can answer any insulation questions you may have!